Spring’s It Shoes Are Called Platforms! It seems that spring is officially here! We are getting the rainy weather as well as the bright sunshine. We have witnessed the trees blooming beautifully and the clean air around us offering pristine views of the landscape about us. We love seeing the tulips sprout and the flowers begin to shed their petals, as they get ready to produce the most succulent fruits. All the while, we are spring cleaning our closets and fixing up our wardrobes, pairing up outfits and generally enjoying shopping for the year’s awesome trends. Since we’ve been looking at the top brands that have appeared on the New York, Paris, London and Milan Fashion Week runway shows, we have decided to present a fine combination of some incredible options by the industry favorites. And the biggest trend we are looking at in this moment is those incredibly comfortable and totally stylish platform shoes! No matter how short you may be, platforms are made to give you a proper boost while still maintaining your personal comfort. Here are a few of the loveliest platform shoes for 2015 to indulge in over these spring and summer seasons! 1. Glittering Spring with Charlotte Olympia: You can transform any look into a spring one with the Charlotte Olympia “Celebration Meredith’ platform sandals. The embellished linen comes with a whole lot of stitching, sequins to boost the spring feeling and buckle fastening ankle straps. The designer color is set at Stone, an off-white hue that shows scuffs and dirt less than a brighter color would. 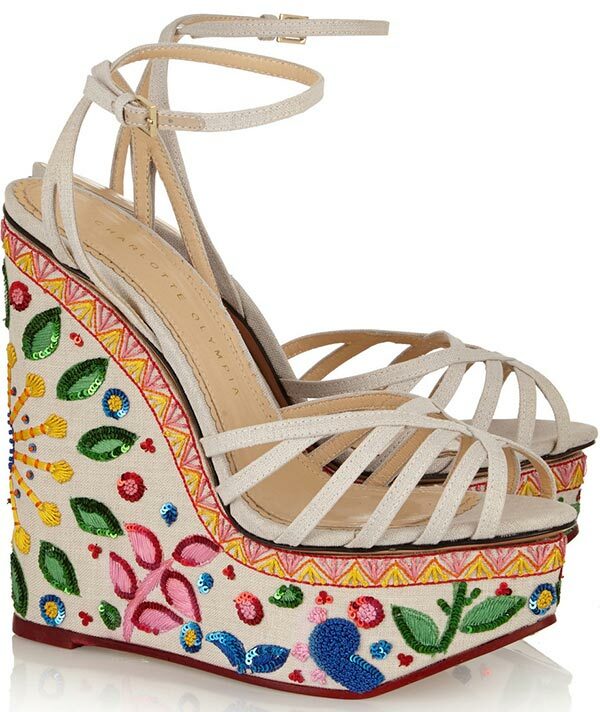 The Mexican theme of the pair is perfect to wear during your next vacation to the latest resort gem discovered. It has been handcrafted in Italy and decorated with colorful embroidery as well as glittering options. 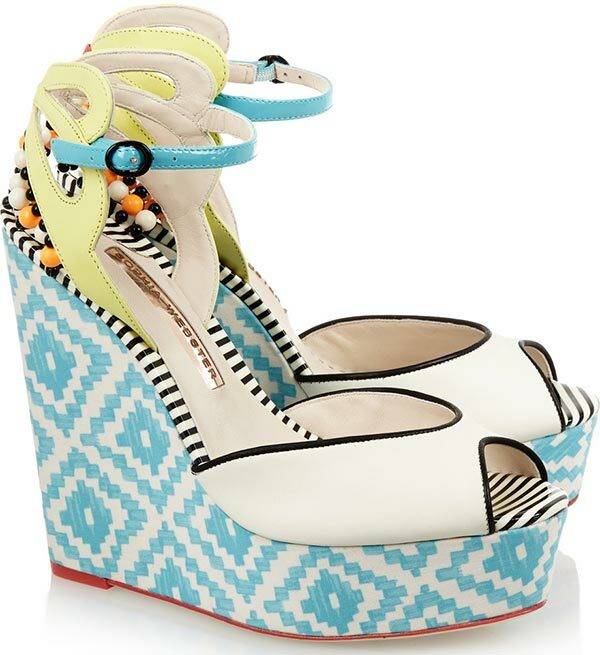 A towering wedge heel defines it with an inch platform for the maximum amount of ease on the soles of your feet. 2. Faux Leather Looks Perfect with Stella McCartney: A more luxurious take on the typical buckled leather wedge sandals, Stella McCartney offers a faux leather version that looks super comfortable and has an awesome platform height. With a rather high heel at 4.5 inches and a 1.5 inch platform to the front, the wooden wedges are positively perfect for the spring and summer days. Light in weight and made to fit the feet nicely, the adjustable straps and the serrated rubber sole ensure extra comfort and a sturdy feel as you walk about town. Paired with denim culottes, this is a pretty cool spring shoe to own. 3. 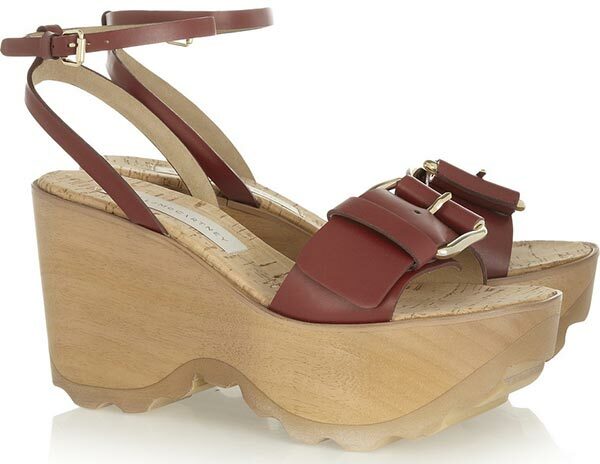 Gladiator Meets Cork at See By Chloe: Think affordable Chloe shoes with this gladiator style platform pair. Now think metallic cork and suede wedge sandal designs and you have a pretty sweet deal. Worn with everything from dresses to shorts, denim and cotton, the ankle tied, black suede gladiator laced golden cork heeled comfortable pieces are 3 inches high in the back and 2 inches below the toes. It has a rather elegant weave to it and brings the olden into the modern world seamlessly. 4. Cowbows On Your Heels with Charlotte Olympia: Not quite costing a grand, these incredibly stylish and fun Round Up leather sandals are the platform heels to turn to this spring. Hand crafted in Italy from ivory leather and finished off with elasticated bow-embellished ankle straps, this pair is one we covet dearly, particularly for its comfortable and supportive fit. 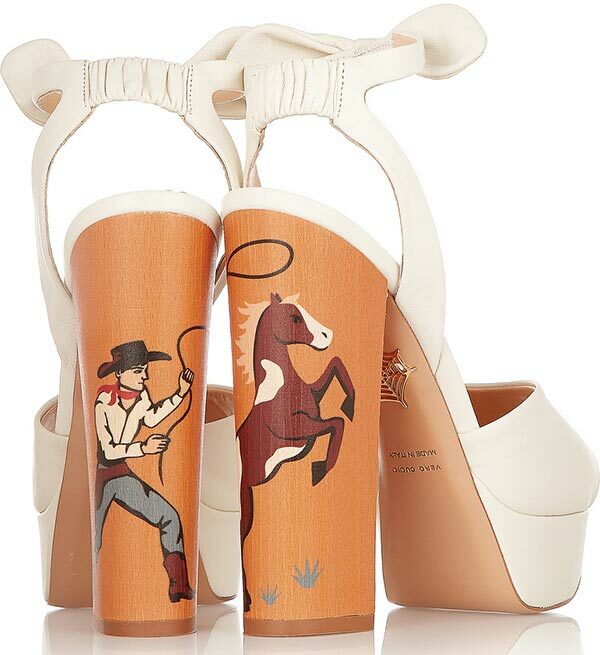 It is easy to slip on, has a wooden heel at 6.5 inches, with a 1.5-inch platform, and features a playful print in the back of the block heel a cowboy and bucking bronco. Higher hemlines are the best way to wear these shoes to maximise their effect on your legs. Plus, who does not like a peep toe for spring? 5. Going Metallic at MCQ Alexander McQueen: There is a lovely pair of metallic leather wedge sandals by MCQ Alexander McQueen. It certainly is a lot more affordable than many others and a casual platform pair of sandals that can be worn with a dress in lieu of heels. We love the contrasting looks as the wedge sole that offers height without compromising on the comfort has gorgeous silver straps with a caramel colored leather sole at approximately 2.5 inches. The faux leather is in a metallic silver that reminds us of futuristic designs, while the wedge itself is a pure black block. 6. 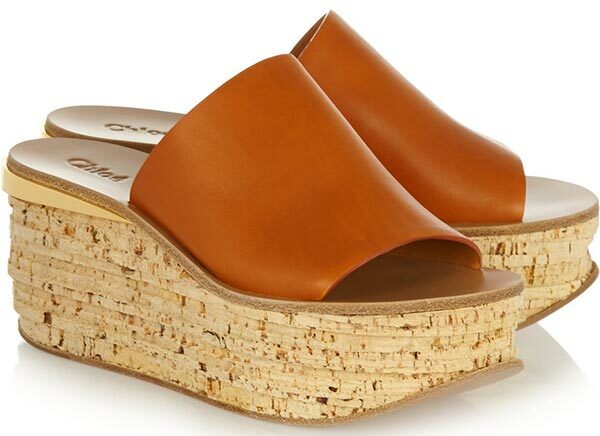 Leather and Cork Wedge Heels at Chloe: While the See by Chloe brand is a bit more affordable, the wedge heel sandals at the main label will have you writing a check for $825 instead. These lovely platforms are actually quite awesome because the distressed cork is light on the feet and gives it a nicely rustic and aged appearance, creating a work of art out of a shoe. It is perfect for late spring and the summer season, to wear on the streets or on vacation at a lovely beach. The pair is made in Italy and has a rich red ochre leather strap that hugs the top of the foot and contours rather nicely, while the high heel is balanced out with a generous platform. We are talking 4 inches in the back and 3 in the front. It is a slip-on sandal with a gold trip for a pretty glamorous finish. 7. Peep Toes with Spring in the Step at Sophia Webster: If there is one gorgeous pair of 2015 platform shoes that screams spring pretty loudly, that is the Lula printed satin and patent-leather wedge sandals created by Sophia Webster. They have a really fun finishing, pretty peep toes, and make for the final accessory to any spring outfit. The toes are covered over with a black, off-white and chartreuse leather cut out, the wedge finished with a light turquoise and white satin balanced with a sizeable platform at 1.5 inches against the 5.5 inches of the heel, and deep turquoise patent-leather for the straps itself, buckled around the ankles in the latest styles. They are perfect with anything and comfortable to wear all day to boot. 8. Trending with Velvet and Suede at Victoria Beckham: The price may be steep but so are those incredible platform heels available from Victoria Beckham. Platforms are huge for the spring season of 2015 and this is one designer who has pulled out all the stops and given us luxe in an entirely reinvented manner. They are bold and beautiful, hand crafted in the country of Italy with a pretty sturdy bottle green velvet heel standing at 6 inches tall, with 2.5 inch platforms to help offset the steepness of the sole. It is held in place with a sling back strap with a buckle fastener, made of the same suede in black that covers the toes and the center of the foot, the bright pink leather trim really making the piece pop with its rich textures. Silver and black should be the colors you wear it with, going for a ribbed cotton-blend sweater with a turtleneck and a silver wraparound silk and wool blend midi skirt. 9. Those Woody Platform Heels at Michael Kors: We love Michael Kors. We always have. 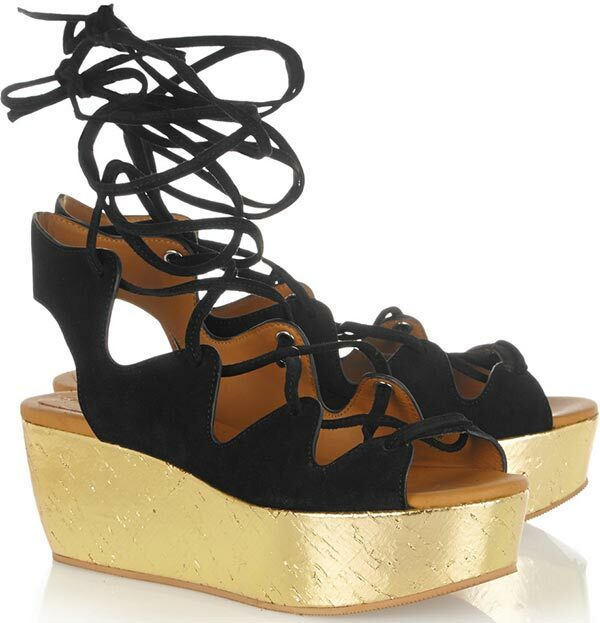 So when we see a pair of leather platform sandals, we just got to have them! We know that spring will not be complete this year without the platform sandals, particularly when paired with block heels, so this 5 inch by 1 inch piece with the whipstitched trims and buckle details is pretty perfect for our daily needs. What makes it even better is the fact that the tan leather shoes here with the luggage designer hue and stacked sole can be worn day or night, no matter the time or the place as they can be dressed up or down as you wish. They are especially fitting with ’70s style looks and bohemian fashions, either with denim shirts tucked into midi skirts and accented with the same tan leather belts and handbags. You can always go for those skinny jeans as well. They look marvellous!